If you’re looking for a photographer for your James Burden Mansion wedding, we would love to help. We have over 15 years of experience in photographing weddings full-time, including many in Manhattan. Not only are we experienced with this venue, but we know NYC. I was born in Queens and grew up exploring the city with my parents, and then later with my friends and husband. I love the bustle and energy of NYC - there truly is nowhere like it! Since we photograph there so often and have our own transportation, we are intimately familiar with driving through New York, parking in garages and on the street, and how to take great photos in this big city. 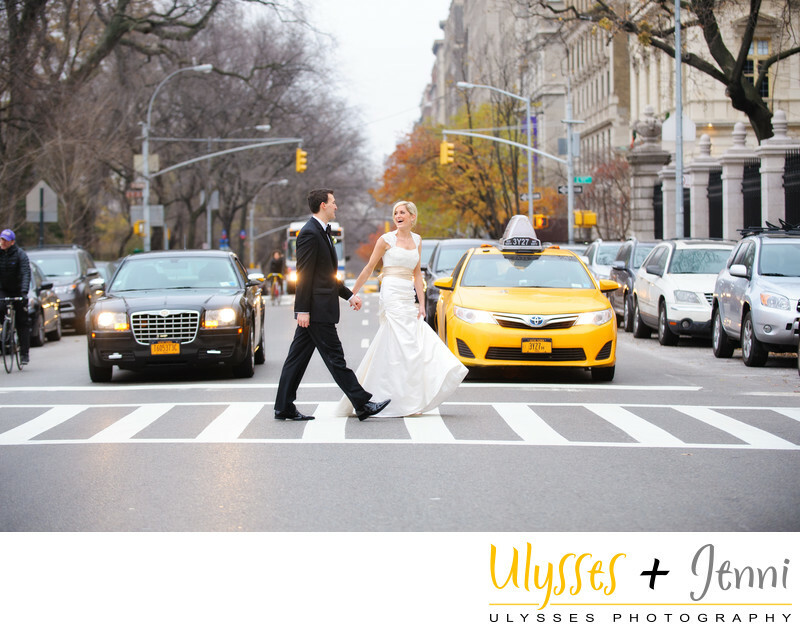 We wanted to convey the bold energy of NYC for this couple, and this image is so classic. The bride and groom are crossing the street as they returned from photos in Central Park. They are heading back to their venue on 5th Avenue. I love how we captured the yellow taxi cab in the background, the bicyclist, the bus, the traffic lights, and the elegant architecture of 5th Avenue. I love this bride’s Monique Lhuillier dress with it’s short cap sleeves and gold satin sash. She looks so beautiful, she stopped traffic! Her smile as she turned to look back at her groom just pulls me into the photo. He looks so dapper in his tuxedo, and his confident walk shows how happy he is to be marrying his best friend. I love everything about this image! If you would like classic, gorgeous images like this, please let us know! We would love to hear all about your plans.